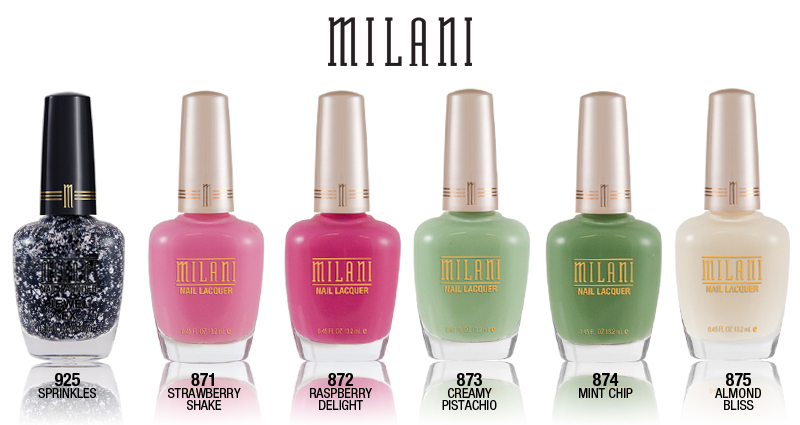 This month Milani Cosmetics is releasing a Limited Edition Nail Laquer Collection called Retro Glam. The collection consist of 5 solid color polishes as well as a topcoat sprinkle effect polish that you can use alone or on top of the solid polishes, each polish is sold separately. Formula: These polishes are free of DBP, Toluene, and Formaldehyde. All the Base polishes are very pigmented and I had no trouble getting a solid layer with the first coat if done right. I absolutely love the formula for the Sprinkles topcoat as it leaves an amazing design and was easy to work with! My Final Thoughts: I love EVERYTHING about this collection, I love the colors they picked to release for the bases but the real gem of this collection is the Sprinkles topcoat! In my opinion it's a MUST HAVE, and if you love the look of it I'd suggest buying some backup(s) before it's sold out! Would I purchase these? I'd definitely purchase this whole collection again (I'm actually considering buying a few backups of the Sprinkles Topcoat as I love, love, love the design it leaves! ).